Throughout Jesse Fischer’s time as a leader of the band Soul Cycle, as well as his work as a solo artist, he has displayed an ability to evolve. Fischer’s work with Soul Cycle did have some recurring themes: On most of their previous albums, the group mixed in covers of artists ranging from James Taylor to Al Green to Miles Davis to OutKast in with their originals. Typically, Soul Cycle’s music resided in that lane where funk, jazz, R&B and world music mixed. However, each of Fischer’s five previous projects had its own unique sound. 2007’s Urban Organics captured the sound of the high point of the 1970s jazz fusion movement, while also including covers such as “Footsteps in the Dark” and originals such as “Forgetful Tendencies,” a track that had a West African feel. The 2010 album Flipped contained funky, keyboard driven originals, but will likely be remembered for its covers, such as an atmospheric take on “Prototype” and percussive version of “In A Sentimental Mood.” The funkiest project of the bunch, 2012’s Homebrew, took its inspiration from a classic funk/jazz fusion album sitting strategically on Fischer’s piano – Herbie Hancock’s Headhunters. 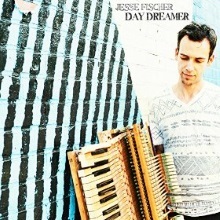 Now comes Day Dreamer, a solo album by Fischer and one that finds the artist moving more into the acoustic, straight ahead jazz direction by showcasing his piano prowess both as a part of ensemble and as a soloist and improviser in his own right. The ease with which Fisher moves from accompanist to soloist is on display throughout Day Dreamer on tracks such as “Sangjee” a cut on which Fischer provides a rhythmic bass for solos by violin and bass while also making space for his own creative forays, while he transforms the traditional Jewish hymn, “Hine Ma Tov,” into an unaccompanied and soulful jazz number. While Day Dreamer includes fusion tracks such as “Nomads,” the funky “Heading Home,” a cut that finds Fischer moving over to the electric keyboard that he played with such good effect on Homebrew, and a cover tune – in this case a Minnie Riperton’s “Loving You” – Fischer looks more in the direction of acoustic jazz. The pianist lets loose on the title track with creative soloing that transitions from pensive to frenetic as Fischer moves deftly to meet the energy given off by the other members of his rhythm section, while his solo on “Mourning Dove” includes a barrage of notes that has the feel of a bird’s wings flapping in the wind.